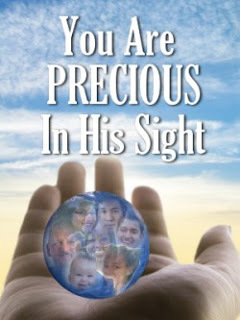 You are precious in My sight, says the Lord, like a pearl of great price! I value you greatly. Those who belittle you and condemn you are coming against Me, says the Lord, for you are Mine, and I laid down My life for you! I have given unto you My best gifts, and I would not do that for someone that I do not love! You are the apple of My eye! You are My prized possession! I created you for My pleasure and have given you everything that pertains to life. I have not and will not keep anything from you that is good. No, not one good thing will I withhold from you. I will not withdraw from you, says the Lord. When I said I AM with you always, believe what I say. When I say you are My beloved, trust My word! Trust that you are special, and there is no power that can pluck you out of My hand. I Am not auctioning you off to the highest bidder, says the Lord. I bought you with a great price to KEEP you. You are NOT FOR SALE AT ANY PRICE! Trust your value in My kingdom and that My purpose for you is important. You are not insignificant and I will never overlook you. What I accomplish on earth will NOT be done without you, says the Lord. I have called you. I have chosen you. I have ordained you. I said you would be productive. Your field of labor will bear MUCH fruit, says the Lord. You are going in the right direction toward your destiny in Me. I Am forging the way for you so that the steps will be easy and you will not stumble or fall. I light the way by the countenance of My own face. Yes, I Am leading the way. lighting the path and I say, “Follow Me!” My voice will always direct you as I whisper, “This is the way; walk in it!” It is a good way, a path of righteousness. It is the path of life…abundant life in Me! This path will take you to your highest level of joy and peace, says the Lord. No path that I prepare for you is filled with sorrow and woe. That is NOT My idea of easy yoke and light burden for you to be encumbered with a heavy, unbearable load and stressed with more than you can handle. Just trust Me, My precious one! I have given you My life, and you will be very fulfilled as you totally give Me yours, says the Lord. When you lose yourself to Me, you will find yourself on the highest level of dreams come true and complete entitlement to receive all that I purchased for you by the finished work of the cross, says the Lord.